King Crab used to be the golden child of the crabbing fishery in Alaska. Sea Captains had reported earnings of $150,000 in a three-week season during the 80s. Granted this represented a significant peak in the crabbing industry and king crab levels saw a sharp decline and were barely even harvested for years after a crash in 83. While the amount of king crab harvested and purchased is hardly where it used to be, the fishery is rebounding and has been looking strong for quite some time. Various varieties of king crab yield high prices with nearly 76% of exports purchased by Japan. King crab varieties are harvested during the season which begins on October 15 out of Bristol Bay, Alaska. Most crabbing is done here, the Aleutian Islands and in the Bering Sea. There are two varieties of tanner crab; the bairdi and opilio tanner crabs. When the king crab fishery took a dive during the 80s, the tanner crab industry became the area of much focus for struggling king crab fisherman. It seems however, that tanner crabs are not immune to their own fluctuations in the industry and over the last several years the harvests have been incredibly unpredictable. For the past two years however, the harvests have been an incredible 79% above industry standards. Dungeness Crab aren’t as financially alluring as some of the other crab species and can also be found in regions other than Alaska, with Dungeness crab being fished all the way down the Pacific coast into Mexico. It is however, an excellent way to gain industry experience before trying to make your way into other crabbing fisheries. Additionally, Dungeness crab harvests haven’t fluctuated as much as some of its counter parts and harvest projections look positive for the coming seasons. Dungeness crab are also found in shallow waters and river mouths meaning that boats fishing for Dungeness crab don’t navigate such treacherous waters. The season for catching Dungeness runs in two seasons as illustrated on our Alaska fisheries calendar: the summer and fall. The summer season runs from June 15 – August 15, while the fall begins in October and runs into November. 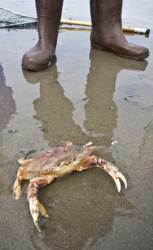 It should be said though, that it is common for many Dungeness crab fisheries to remain open until February. So if you think you can handle weather, hours and the demand physically on your body and also don’t mind paying your dues as a processor or cook, perhaps, just maybe, you might be able to find a spot in the popular, dangerous and ever-alluring crab fishery in Alaska.